On the 16th of July, my colleague Paul and I set off for Berlin! 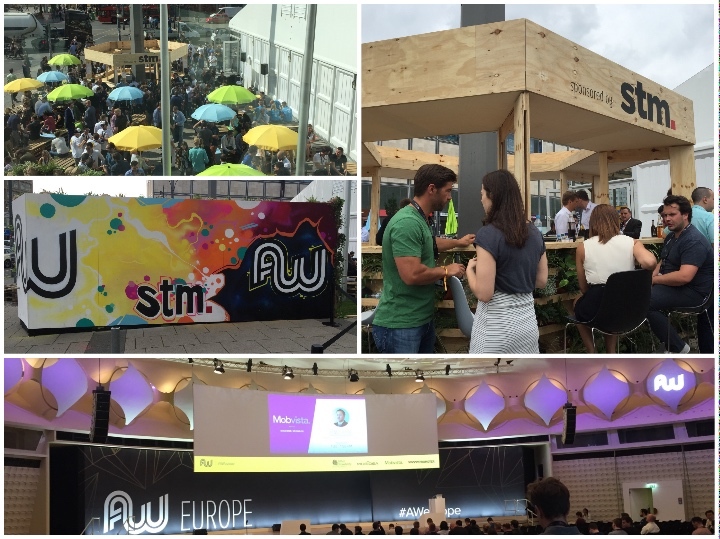 We were of course en route to attend one of the most anticipated and talked about affiliate marketing events of the year: Affiliate World Europe Berlin. Now for those of you who read my blog or know a little about me, you’ll know that I don’t travel to another country how most people do, as I unfortunately don’t fly. Therefore when I set off, I mean we hit the road for a 16-hour journey on the long roads to Germany. 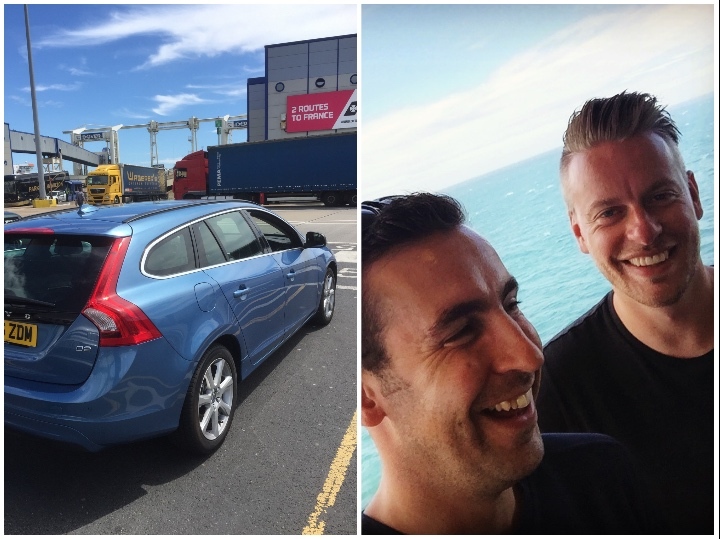 We were lucky enough to be given a brand new Volvo V60 thanks to our involvement with Lovecars, and although this wasn’t a high spec one like the one we took to the South of France, it’s still a GREAT car for long journeys. I took the UK leg driving and we set off from Bristol at 8.00am with our first destination being the port of Dover to catch the ferry to France. Paul and I took it in turns to drive through England, France, Belgium, Holland and finally Germany until we reached Hanover at around 2.00am on the Sunday morning. We found ourselves a cheap hotel and rested up for the day ahead. I’ve been to many exhibitions and trade shows in the past but none outside of the UK, so this was a first for me and a very exciting first indeed! What I did in the following week was subconsciously ensure myself that I was going by putting myself into a situation that I couldn’t back out of, because I knew in the long run that if I didn’t attend the show, I’d seriously regret it! After that conversation with Lorenzo, I went full force booking meetings and hotels, securing the car, and most importantly organising an opening party on the Sunday before the show alongside my good friend Rohial Rizvi aka The Suitcase Marketer. It became our main focus for the following week, and I must admit, I was pretty amazed myself when I managed to secure 5 sponsors within the first 2-3 hours of deciding we’d host a party! Once we had our sponsors and venue all but confirmed, I put our guys to work on the artwork and had them produce the flyers, TV slides and website amongst other things we needed to promote our party. A huge shoutout goes to Rohail (The Suitcase Marketer) and the amazing work he did alongside myself to make things happen! Sunday….the day of our party! 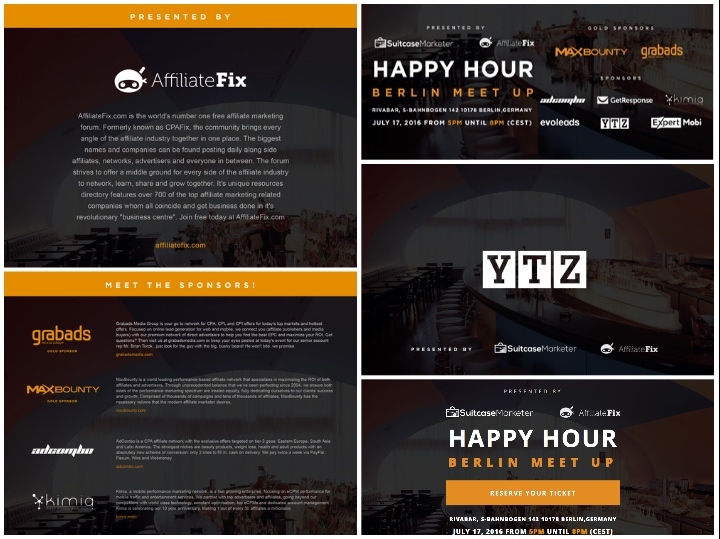 AffiliateFix has sponsored affiliate balls and other events before, but never have we hosted our own, so as you can predict, I didn’t get much sleep that night. 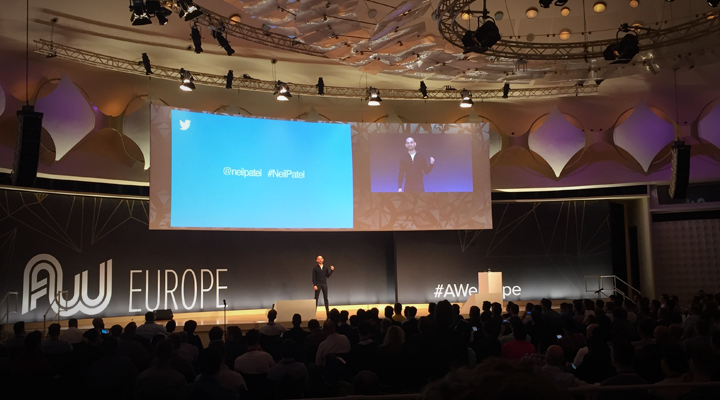 Paul and I woke up at a good hour to give ourselves enough time to be in Berlin by midday. We weren’t allowed into the venue until 4.30pm and the party started at 5pm, so we checked into our hotel and enjoyed our first German beer. 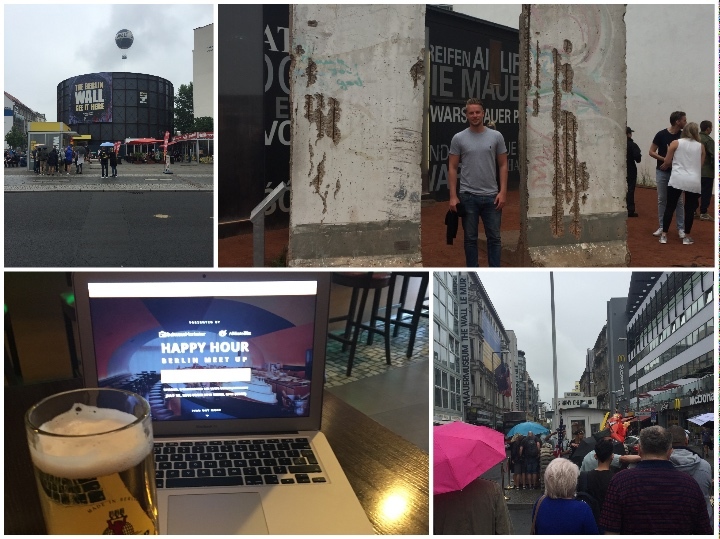 We then took a walk to view some of the sights on show in Berlin including the wall and checkpoint Charlie. I must admit I was pretty disappointed with the tourist attractions and with Berlin in general. The food and drink were great and reasonable, but the city felt lifeless and the architecture was nonexistent. Maybe we visited the wrong places? Okay, so it’s now party time! After trying on several outfits (much to the annoyance of Paul), we headed over to the Rivabar where our party was being hosted. WOW was my first reaction. Not only was this place super cool and funky inside, but we already had about 30 people lined up on the seats ready to attend our event. I mean we told people to arrive early, but this is awesome! I spent the next 30 minutes coordinating the bar staff and team, meeting the photographer, setting up the sponsors, shaking guests’ hands, and getting everything in place for the 5.00pm start. Ro’s taxi driver took him to the wrong venue, so I have to admit I was a little anxious, but I was born to lead a team and I felt a real rush bringing everything together. Nonetheless, it was great to see him walk through the door to share the load. Andy also turned up just before we got started. He was on holiday and had to connect flights on the Sunday where he joined us in Berlin. Another good face to calm my nerves! 5.00pm, let’s open the doors…..
Ro, Andy, Paul and I spent the next hours making sure the party and event went according to plan. We greeted people at the door, liaised with the staff, and made sure everyone was having a good time. As for my fear of no one turning up, the pictures below don’t do it justice, but we crammed 400 people through the doors and overspilled onto the streets in the front and back. The very best part of the party was bringing and seeing so many AffiliateFix members together in one place. Having members and sponsors come up to us and tell us how much they’ve enjoyed it and how we should host our own events in the future was a humbling and incredible feeling! We ended up extending the time of our party by several hours as everyone was having such a good time. Ro and I stayed until everyone was gone, settled up with the incredible team at the bar, and then treated the team alongside our friends from GetResponse to a few drinks and a meal. Day one done, and what a day! Day 2 was all about the show and business. We set off to register for the show bright and early and managed to get ourselves in to take a look around. The size of the venue was perfect and the layout worked well. They even managed to have some really great breakout spaces where you could either cure your hangover or set up meetings or drinks with fellow attendees. We spent the first part of the day scouting the floor and speaking with everyone at their booths. It was great to finally meet so many people and put a lot of faces to names. There are too many to mention, but we managed to meet a lot of old and new clients at the booths and speak with lots of networks and traffic sources who are active on AffiliateFix.com. The best part was all of the networks were so complimentary about our platform and thanked me for providing such a useful resource for them to connect with their publishers. 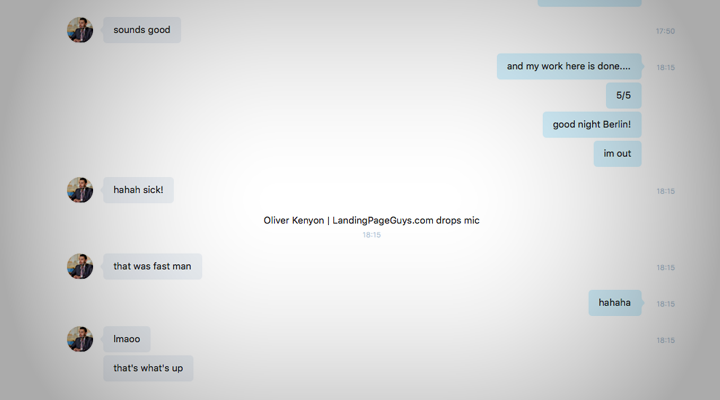 The afternoon was filled with meetings for Andy and me, mainly representing the Landing Page Guys. We had back-to-back meetings organised all afternoon and even managed to squeeze in some unscheduled ones using the very intuitive mobile app provided by AWE. It was great to also take a break at the STM bar outside in the early evening, and if I’m being fair, more business was done over a beer in the sun than inside. It was almost like its own meet market with everyone flowing past each other and stopping to discuss business. 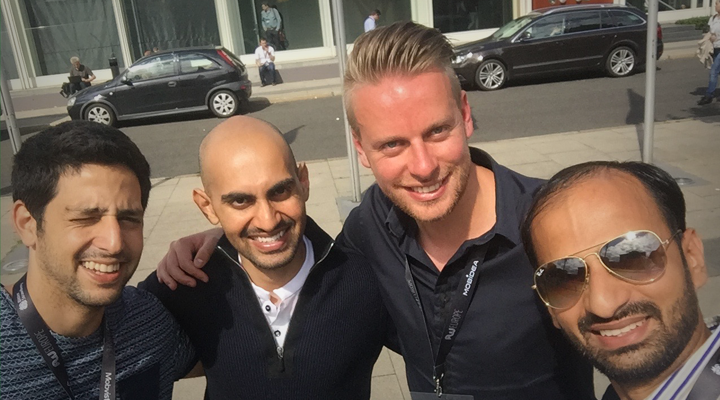 We arranged to meet two of our long-term clients whom we’ve yet to meet in person before. They were certainly awesome guys and we spent the next few hours discussing shop. So as day 1 of the show wrapped up, we headed back to the hotel to freshen up before jumping in an Uber to Soho House Berlin. It was pure coincidence that the CEO of our main developers who work on Lovecars and “Project P” was in Berlin for the exact same dates with his wife. He invited us for dinner so we grabbed the opportunity to catch up and discuss the project. The views from the house were too good to turn down also! We spent the night relaxing on the rooftop and were later joined by some affiliate friends also. Breakfast, shower, Uber to the event! Day two was a little less busy for us as far as meetings go, as we kept our schedule free to watch the infamous Neil Patel grace the stage with his presentation. I’ve been a HUGE fan of Neil for a long time as he’s someone I’d love to one day compare myself with. The fact that he actually practises what he preaches, instead of just bullshitting his way through “consulting” or some other crap, is a real inspiration to me. Andy, Ro and I sat down at the back of the theatre and watched Neil smash it on stage. He talked for about an hour, and although we watched some other talks at this event, he was by far the most charming, informational and natural speaker. He had captured the audience in a great way by using humour, alongside some real incredible tips and content, as he showed us how you can get more conversions out of your existing traffic. He also preached to think long-term and to not JUST be an affiliate, which is similar to the post I wrote telling you to NOT be an affiliate marketer, but to think bigger, more long-term and more sustainable, which is what I’m doing myself. After Neil’s talk, we had a quick bite to eat and caught up with my very good friend Eden from SelfAdvertiser.com before heading to the beer garden! We met some new clients at our favourite STM bar again, and after a few drinks, I noticed out of the corner of my eye Neil trying to hail down a taxi. It was one of those moments in life where you think to yourself, “Do I go over? Do I introduce myself?” and I thought, “Do you know what? Life is too short”. I’m not sure if it was the beer or the balls, but I jumped the barrier and made my way over to Neil to introduce myself. He was speaking with my friend Kulwant, who’s an amazing blogger and photographer. I felt a little bit like a “fan” but I waited until they stopped talking and introduced myself to Neil. He was a really nice guy, and we spent the next ten or so minutes talking about different things and he told me he’d heard of AffiliateFix and my name being mentioned, which was a really cool thing to hear. Kulwant asked for a picture of us all together, which was a great bit of memorabilia for me and him. He later put it on Facebook with an awesomely nice tagline, and I’m not going to say we broke the internet, but we received over 600 likes within 30 minutes and I personally had over 100+ friend requests instantly! Kulwant knows his stuff! Neil and I have since exchanged emails, and I’m looking forward to speaking with him further and hopefully having him consult for “Project P”. That evening, we caught an Uber to a really cool German restaurant to have a private AffiliateFix dinner with a few close friends. 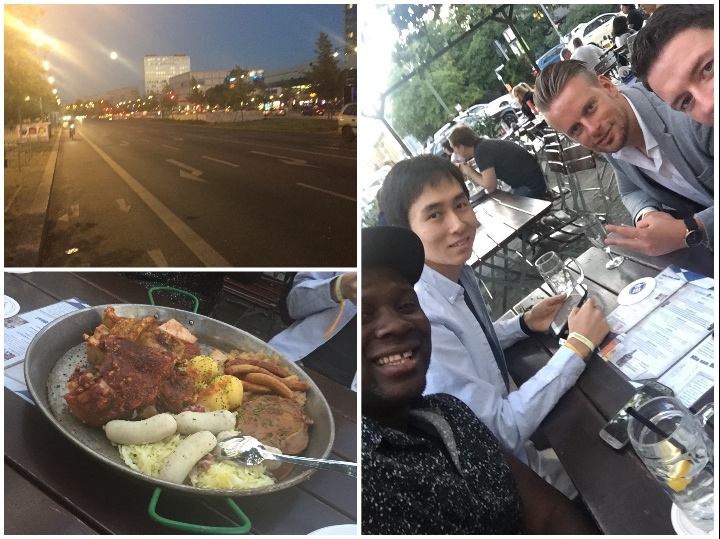 Andy, Tai (cashmoneyaffiliate), Servando and I enjoyed a traditional German meal, which featured a LOT of meat alongside a few beers, before heading out for the night. It was the last night of the event, and Tommy had invited me and 4 of my mates to be their VIP guests at the ROBO-TEKA party, the closing party hosted by the fantastic BitterStrawberry. 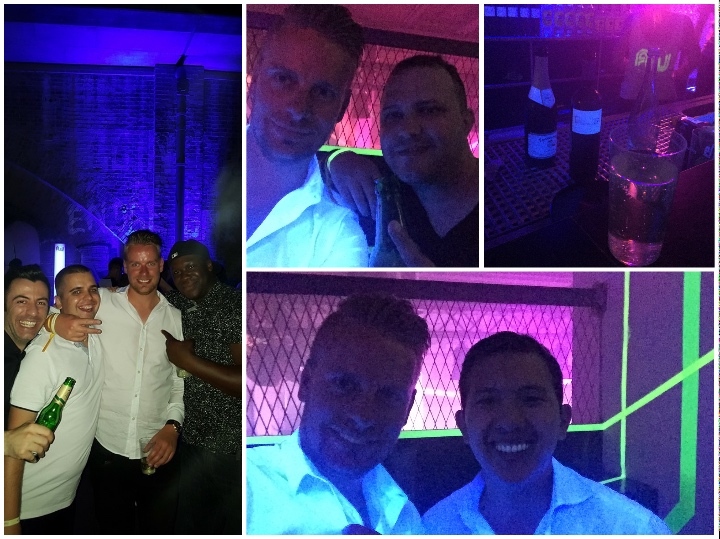 I must admit the venue was impressive and the guys had done a great job in dressing it up with various rooms, lighting effects, and spaces to drink, talk and party. 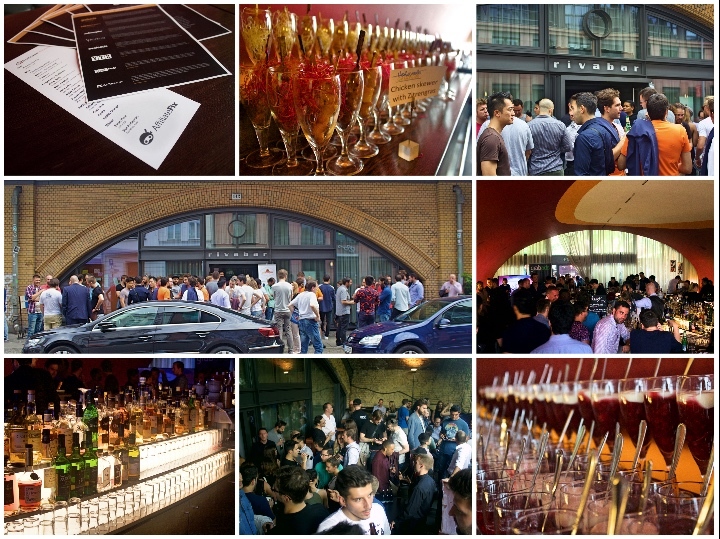 Over 600 guests proceeded to pile into the venue as we enjoyed a free bar up in the VIP spot. The VIP was the best place to speak with other likeminded people and was the perfect place to catch up with some friends. I spoke in length with my friend Charles Ngo as we discussed the possible involvement of him in “Project P”. As you can see below, Charles and I were unaware this would be a UV party, so both wearing white, the pictures of us didn’t really put us in a good light….. I spent the next few hours networking with others up and downstairs and even ran into my good friend Attila from iamattila and Christina, aka the FBQueen. It’s always awesome meeting these guys, and it was a real eye-opener when we had loads of people requesting to have their photos taken with us! That was an odd feeling for sure. The last day and event was a wrap, we got a good night’s sleep, and started our long journey home. 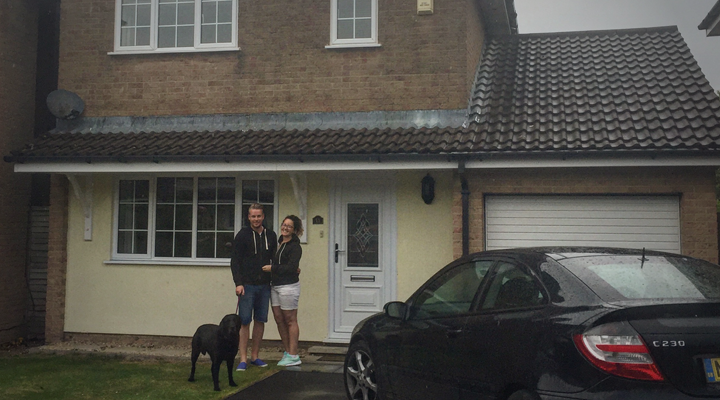 Oh, and when I got back, I officially had A NEW HOME at last! This was one of the best weeks of my life! I want to personally thank Lorenzo and the whole crew from iStack for opening my eyes and inspiring me, and of course, for hosting an incredible event. Here’s a shout-out to everyone who turned up to our party, the amazing sponsors, incredible AffiliateFix members, and my co-host Ro! Thanks as always to Andy, Paul, Tai and Servando for always helping me out and for being the best crew ever, and to everyone else we met old or new, you’re all awesome! Oh, and be on the lookout for our own events very soon!